Highly suspicious body camera video from the Vegas shooting has just been released showing a strike team being instructed to turn their body cameras off. Las Vegas, NV — After being forced to release information on the October 1 massacre, the Las Vegas police department—in an insultingly futile attempt at transparency—has been dumping information related to the shooting. In what appears to be a deliberate attempt to muddy the waters, much of the video released by the department has no time stamps and is provided without context. However, one particularly suspicious set of videos was released Thursday which shows cops being told to turn off their body cameras. For months, the Las Vegas Metropolitan Police Department has been caught lying, railroading journalists, and done everything in their power to keep the facts on what happened on 1 October from ever reaching the public. The department’s desire to keep the information secret was so overwhelming that they fought its release all the way to the Nevada Supreme Court. Early last month, however, the court rejected the police department’s bid to keep the records secret and they are now forced to hand everything over. Instead of cataloged evidence and detailed reports, however, they’re merely releasing random unlabeled pieces of information. A large dump of video taken from 28 different body cameras was released this week. According to the Las Vegas Review Journal, most of the videos had no time stamps, but they were taken at some point during the response to Stephen Paddock carrying out the massacre. Four of the videos in this massive dump of footage show officers who are part of a strike team assembling near the Mandalay Bay Casino. According to the chatter captured on the video, the strike team is prepping to enter the hotel. As the Journal reports, it is not clear when or why the cameras were activated. One video is 18 minutes long, one is 20 minutes, and two others are just over a minute each. It is also unclear why the officers were told to turn their cameras off. When the Journal reached out to the department to clarify why officers were told to turn off their body cameras, predictably, the department did not answer. However, their body camera policy is public and these videos appear to show them violating it. 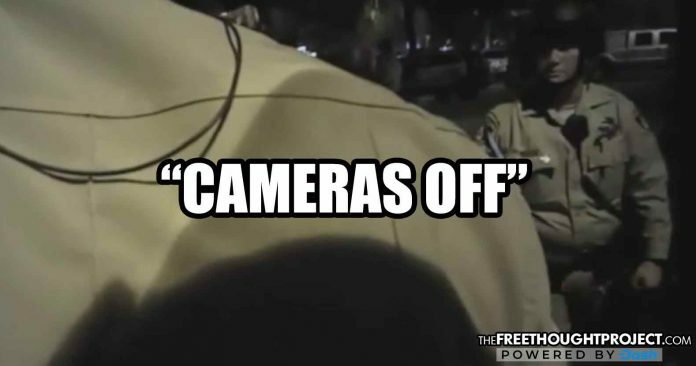 According to their body camera policy, once the officer’s camera is activated, it should continue recording unless there is a reasonable exception. The more information that comes out on the horrific events of that fateful night, the more questions the public has. The uncooperative behavior by the Las Vegas Metropolitan police department is a kick in the teeth to the victims and their families. As the suspect video below shows, from the very beginning of the shooting, Vegas police were actively engaged in keeping this information from the public. Shameful indeed. If you’d like to voice your concern about their lack of transparency and overt attempt at covering up the facts as to what happened in Vegas, you can peacefully do so at the department’s Facebook page, here. Or, you can call them at (702) 828-3394.